Shaking tables, also known as wet tables, consist of a riffled deck on some type of support. A motor, usually mounted to the side, drives a small arm that shakes the table along its length. The riffles are usually not more than an inch high and cover over half the table’s surface. Varied riffle designs are available for specific applications. Shaking tables are very efficient at recovering heavy minerals from minus 100 microns (150 mesh) down to 5 microns in size. Deck sizes range from 18 by 40 inches for laboratory testing models to 7 by 15 feet. These large tables can process up to 175 tons in 24 hours. The two basic deck types are rectangular and diagonal. Rectangular decks are roughly rectangle shaped with riffles parallel to the long dimension. Diagonal decks are irregular rectangles with riffles at an angle (nearly diagonal). In both types, the shaking motion is parallel to the riffle pattern. The diagonal decks generally have a higher capacity, produce cleaner concentrates, and recover finer sized particles. The decks are usually constructed of wood and lined with linoleum, rubber or plastics. These materials have a high coefficient of friction, which aids mineral recovery. weight is fed with wash water along the top of the table. The table is shaken longitudinally, using a slow forward stroke and a rapid return strike that causes particles to “crawl” along the deck parallel to the direction of motion. Wash water is fed at the top of the table at right angles to the direction of table movement. These forces combine to move particles diagonally across the deck from the feed end and separate on the table according to size and density. the concentrate end. 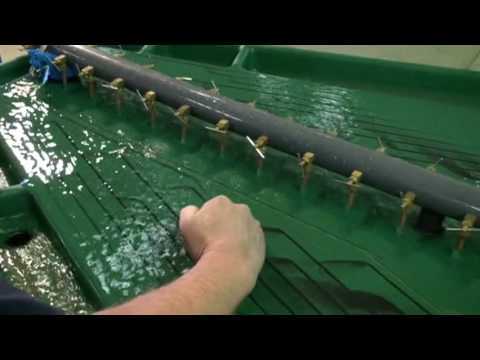 Due to the taper of the riffles, particles of progressively finer size and higher density are continuously brought into contact with the flowing film of water that tops the riffles, as lighter material is washed away. Final concentration takes place in the unriffled area at the end of the deck, where the layer of material at this stage is usually only a few particles deep. The separation process is affected by a number of factors. Particle size is especially important. 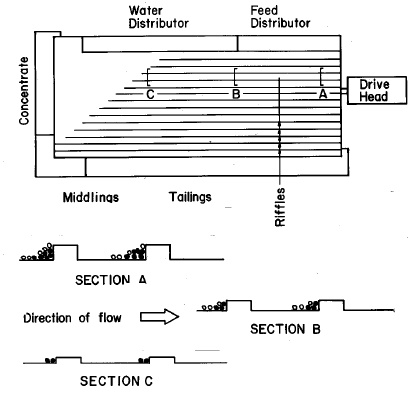 Generally, as the range of sizes in feed increases, the efficiency of separation decreases. A well classified feed is essential to efficient recovery. Separation is also affected by the length and frequency of the stroke of the deck drive, usually set at V, to I inch or more with a frequency of 240 to 325 strokes per minute. A fine feed requires a higher speed and shorter stroke than a coarse feed. 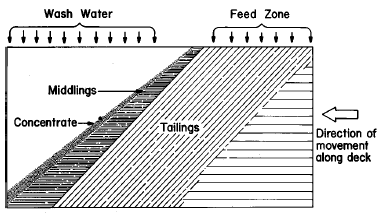 The shaking table slopes in two directions, across the riffles from the feed to the tailings discharge end and along the line of motion parallel to the riffles from the feed end to the concentrate end. The latter greatly improves separation due to the ability of heavy particles to “climb” a moderate slope in response to the shaking motion of the deck. The elevation difference par- allel to the riffles should never be less than the taper of the riffles; otherwise wash water tends to flow along the riffles rather than across them. widely spaced riffles on a linoleum covered deck. Holman and Deister produce widely used slimes tables.